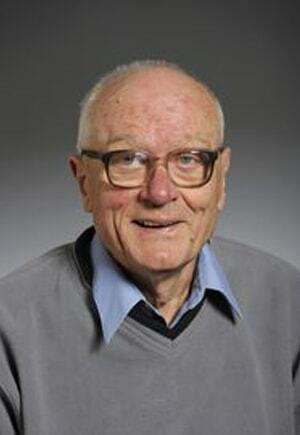 Luc Berger is well known for his theoretical studies on metallic ferromagnets such as iron, nickel, cobalt and their alloys and glasses. His research investigates the interaction of conduction electrons with spin waves, domain walls, film interfaces and other disturbances of the magnetic spin system through the s-d exchange energy and through hydromagnetic forces. The conduction electrons also undergo anisotropic scattering by magnetized chemical impurities through the spin-orbit energy. L. Berger, Relation Between Damping, Current-Induced Torques, and Wall Resistance, Physical Review B 75, 174401 (2007). S. Mukherjee and L. Berger, Switching of Composite Media by Wall Propogation, J. Appl. Phys. 99, 08Q909 (2006). L. Berger, Analysis of Measured Transport Properties of Domain Walls in Magnetic Nanowires and Films, Physical Review B 73, 014407 (2006). L. Berger, Relation Between Giant Magnetoresistance and Critical Current for Spin Precession in Magnetic Multilayers, Physical Review B 72, 100402(2005). A. Rebei, L. Berger, R. Chantrell, and M. Covington, 1/f-Type Noise in a Spin Valve, J. Appl. Phys. 97, 10E306 (2005). L. Berger, Influence of Current Leads on Critical Current for Spin Precession in Magnetic Multilayers, J. Magn. Magn. Mater. 278, 185 (2004).